THE LEADER IN DUST COLLECTION! Sanding hardwood floors used to be a dust producing nightmare, but this no longer needs to be the case. 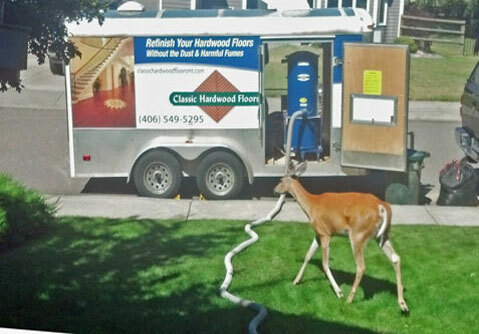 Classic Hardwood Floors listened to our customers and in 2005, we became the first flooring contractor in Western Montana to own a Bona Atomic 110 Dust Containment System. With Bona’s dust containment system, the airborne dust that is generated by sanding a floor is almost entirely eliminated. And in 2012, we again upgraded our dust collection system to the Bona Atomic Trailer Mounted Dust Evacuation System. This system is powered by a Kawasaki engine which significantly increases airflow inside your home. The trailer is parked outside your home, versus a conventional vacuum which typically remains inside the home. The result is a dramatically more powered system, providing evacuation of the airborne dust that is generated by the entire sanding process. Our dust collection systems allow for a healthier environment not only for our customers, but also our employees. The Bona Atomic Dust Containment Systems are GREENGUARD certified for indoor air quality. What does this mean? The GREENGUARD Environmental Institute is an industry-independent, non-profit organization that establishes standards for testing indoor products. Their goal is to improve public health by helping manufacturers build safer products.